The IR-4 Project launched a bee friendly plant search page. The IR-4 Project at Rutgers University is pleased to announce the launch of the Plant Search page on the Protecting Bees website. Users can search for pollinator attractive plants by zip code, bloom period, sun/light requirements, and/or pollinator attractiveness. Once the search is complete, users can download a printable list of select plants, compare pollinator information (limit of 5 plants), or get detailed information about the attractiveness data and links to the data sources. This plant search tool is a necessary resource for anyone with an interest in protecting pollinators and growing plants. Planting pollinator attractive plants provides insects and animals with essential resources, while helping plants survive and flourish. All pollinator attractiveness information on Protecting Bees comes from reputable scientific studies or publications. New plants and pollinator information is constantly being added, so be sure to search Protecting Bees for attractive plants when planning for your next planting or when guiding others about pollinator beneficial gardens! The website is sponsored in part by USDA-NIFA-SCRI. James Bethke's group (San Diego UC Cooperative Extension farm advisor specializing in nurseries and floriculture) and Christine Casey are UC contributors to the larger project's collaborative group. 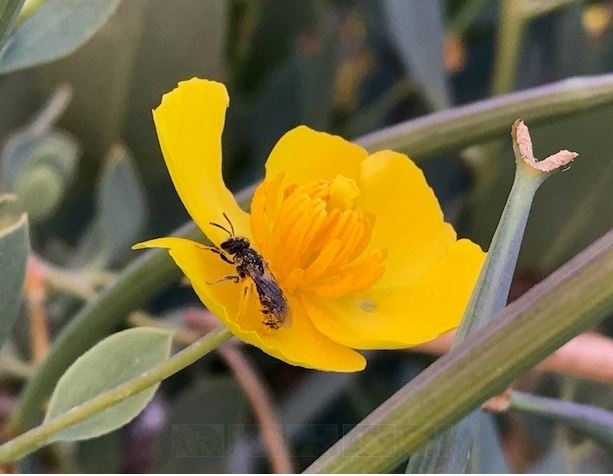 Native bee (probably a member of the Megachilidae family) on bush poppy (Dendromecon rigida).